Hello friends — happy springtime!! A1 TOP PIECE OF NEWS: I have finished the book. Not the novel, but the other book (The Rise and Fall of Jenny Goodguts). It has a gorgeous cover that I will share any day now. I predict it will be available for purchase in two weeks. TWO WEEKS! First I have to review a proof copy, so it is possible that could slow things down a tiny bit, but not much. I feel terrified and excited and proud. SECOND MOST EXCITING NEWS: I am in a band! We are discussing our name tonight. We have a two-hour show on April 24th at the Evening Star. Our first one. I’ll be performing music live for an audience for the first time since before the kids were born (and long before that). It feels amazing to make live music with other people. I’ve missed it so much. Local wildlife report: There are two pairs of goldfinches sitting outside of my window right now, hanging out in the blooming dogwood. We also have a resident fox who sits on a log outside my window. 100 Rejections: I have received my first rejection (the first one within the scope of this project, that is). It was from The Sun, not The New Yorker. I am very glad they rejected the piece as now I have had the chance to significantly improve it. I haven’t submitted anything else recently because of trying to finish the book so I’m sitting at 4 total submissions, 1 rejection, no publication. I’ve started a separate list to track the things I ask for where rejection is possible but that are not a submission of writing for publication. I sent a letter to the literary estate of E.B. White asking to include a quote of his in my book. And I also applied to join The Author’s Guild as an “Emerging Writer.” There was an actual application and you had to answer questions about your plans and publications. You pay a fee to join, so I imagine they are somewhat lenient in expectations in my particular category, but I got in! 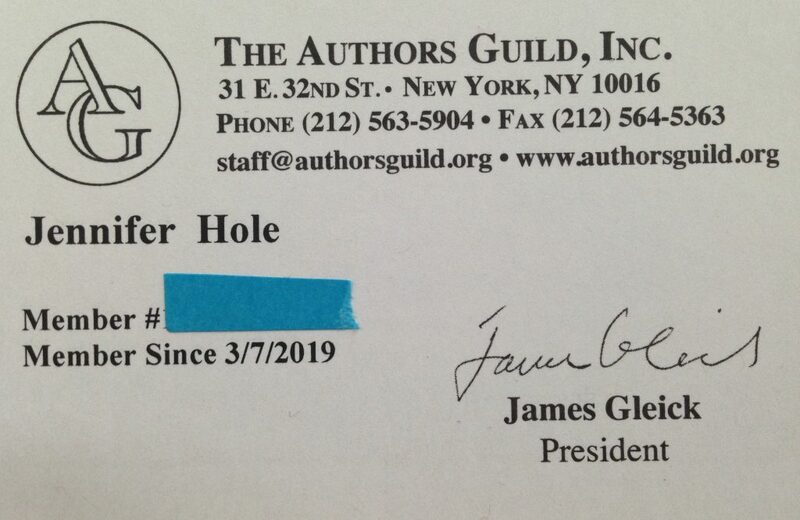 I’m officially, as of March 7, 2019, a member of The Authors Guild. I have a membership card and everything. The Stuffed Project is still underway with numerous almost shareable thoughts particularly about Valentine’s Day and the various cultural practices by which we commemorate the births of our children. Four years ago I walked outside to buy a sandwich to eat at my desk in my windowless office. Not pregnant, I was wearing maternity pants although my son, my youngest child, was almost two years old. When I arrived back to my desk, I wrote a few paragraphs, my own thoughts that, for once, insisted on taking form. Today, I’m sitting at home. I ate lunch, some reheated leftovers, hastily at my desk where I can see the buds on the dogwood outside of my window, almost ready to open. I’m wearing my hoody sweatshirt and sweatpants, the same ones depicted on the front cover of this book. The sun is shining. I’m not a published author. I haven’t finished a novel. I haven’t figured out a master plan, I haven’t found a pot of money, I still feel scared every time I share my words. I have allowed space, I have listened, I have asked for help, I have studied, I have done what scares me anyway, I have sat uncomfortably and waited, I have practiced, and I have learned. Later this month I am singing, I have a two-hour show at a local bar with a band. We practice every week on Tuesdays after the kids are in bed. I’ve submitted my writing and received my first rejection. I am practicing every day. I’m trying to love the world that is. I’m trying not to hide. I see that I was confused by the certificates. I thought I needed permission. I thought approval provided some guarantee. This book, the one you are reading that is now at its end, was not the plan. Having read this far, you won’t be surprised to know that there wasn’t a plan. But compiling and publishing all of this introspection was not what I would have imagined as my first big splash (or tiny ripple) into the world of letters. If I had not lost (most of) the novel, things would be different. But I did lose it. And that led me to a sad but resolute place. And that led to a conversation with my husband about finishing things. And that led to a decision to finish something. And that led to telling a lot of people I was going to publish this book. And that led to revisiting all of these words, and considering them as a whole. And that led to a few minor revelations. And that led to more conversations and questions about why I had not yet taken action to share my writing in the usual ways. And that led to exploring the usual ways to share writing, and to submitting my work for publication, and to more writing, and reading, and waiting, and learning. I believe the novel will be better for all of this. I hope, one day, to say many useful things beautifully and with humor. But now here I am, with a book all about myself, ready to share with any living human who decides to open the cover. I can tell you, that’s a scary place to be. This is why people write novels. And fiction. And non-fiction about things other than themselves. This is why diaries are published when people are dead and why memoirs are told in hindsight, sharing what you want to share, rather than your often tortured and sometimes embarrassing inner thoughts. But its done. This is what I have made, what I’ve finished. So now it is time to share it. Time to place my intention in the vast ocean of possibility and allow the universe to work through me. And then I will be ready to make what is next. Hello readers. A quick update on the book: it is inching closer to life. The cover is looking like a real book cover for a real book. I purchased the ISBN numbers that will allow the book to be sold in a bookstore, if any bookseller should be so inclined (I’m planning to publish a paperback and ebook, and also to record as an audiobook, but that will come later). The interior layout is complete. Mostly now I just have to be brave. I’m sure there will be more final changes and decisions, especially since this is my first book. But it is getting there. One reason I chose the word Finishing as my 2019 word was that, in reading through the past four years of my blog posts, I saw over and over the same ideas, or the same vague statements of intent regarding things I would do in the future, things I would write about. I started to make a complete list of everything I said I would do in the pages of the book that I have not yet done, or the things I started and didn’t finish. I looked at the list. It felt overwhelming. Not exciting. Heavy. Time passed. And then I changed the plan. Now, I am going to list the things I said I would do that I am still committed to doing and I’m going to tell you what I said I would do that I’m not planning to do anymore. If you’ve been waiting for something I said I would do four years ago, let me know. I’m trying to learn how to find the right balance of making promises and finishing what I start. This is a concept that I’m thinking about within The Stuffed Project. I’m not sure that a parenthetical mention of something I planned or hoped to write more about someday is a promise so much as it is an idea. Maybe what I’m doing here is clarifying my language so that I am clear on what is a promise and what is an idea, so that I don’t allow the quantity of the latter to keep me from following through on the former. Related to what I called project:defrag in the book, I rolled out The Stuffed Project in December 2018. Right now it is mostly a group of letters written from me to various inanimate objects. I will make no commitments in terms of the content of these wonderings (though birthday party favors are likely to be addressed), but I am committed to this project and to putting the thoughts into the form of a book, when a book emerges from the thinking. My current working title is Stuffed: One woman’s odyssey to reimagine our relationship to the material world. 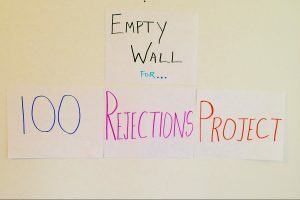 The 100 Rejections Project is also underway and I’m sharing updates on the blog (4 submissions, 0 rejections, 0 accepted). Until October 2018, I had never submitted my writing for publication anywhere. I didn’t know how. I didn’t know where. And I was afraid. I don’t think I was afraid of rejection, exactly. I think I was afraid of being known (yes, I do see some inconsistency in light of the contents of my upcoming book), not sure if it was safe or okay or acceptable to share my words, or if anyone, that is, anyone who did not already care about me for other reasons, would take an interest in my thoughts. It does hurt or it can hurt to be rejected, but it is embarrassing to be known to be rejected. And even those aren’t quite the right words. I feel hesitant to put others in the position of knowing that I’ve been rejected and needing to say something to me about it. That specific uncomfortableness is something I have worked to avoid. I write to write. And I would love to share and I would love to be known to other writers, I would have loved to sit down with Ursula Le Guin. I would love to have corresponded with E.B. White. But if an editor sends me a note that my poem or essay or story isn’t for her at that time, I don’t know, it hasn’t happened yet, I’ll have to tell you later. But I feel good to be submitting. To be learning how to submit and where to submit. To be imagining sharing my words with more than my nearest and dearest. I believe that I will find some outlet, and I am curious enough, interested enough, and free enough—I am free—to try. This is a book (something like an iMac photobook) about my soul mate Sawyer, the 14-year-old golden retriever who went to Doggie Heaven the year before my daughter was born, from whom, I believe, she received her copper hair (a spiritual, rather than biological inheritance). I have all of the text and photos, I will be buried with this book. I’ll let you have a look too, if you want. There’s a lot of love in that essay. I’ve written about this on the blog, maybe only once. It’s a game, of sorts, that we played with our kids that resulted in their willingness to try many new foods and to eat, without complaint, a number of others. It’s another spreadsheet, super basic, already made. It will take me 45 minutes to briefly describe and share. So I will. Things I’ve made that are potentially useful and require additional thought to be most helpfully shared but that are not as exciting as other things I am doing right now but that I started so I should… (hmmm, I don’t like the word should)… I prefer not to use the word “promise” in relation to the following. But I am not crossing them off of the list. This is something I made that was fun and helpful and currently is not shared, in any form, anywhere. I don’t know whether I will improve or add to what is already written, the original system and notes, but I can take all of what I’ve done so far and share for folks to use. Ah, here she is, buried at the back like a tiny footnote. What ever happened, you might have wondered, to the Happy Atmosphere Challenge? You can access the complete challenge via the blog (it is a list of activities, a scoresheet, and a rationale explaining the basis for the activities chosen). I implemented some of what I learned while writing it but I never followed through, all the way. I wrote it, but I never did it, and I hardly shared it. I learned a lot in putting it together (about motivation, about overwhelm), but I want to revisit, I need to modify it based on what I’ve learned in the interim, and then I would like to follow through. Groan. Another promise? So…. many…. Yet I’m sure that this is an important part of what I want to share moving forward. I have mentioned it numerous times in the book, it warrants more explanation, I will provide one, in some form, at some point. I mentioned my intention to write this piece in my very first blog post four+ years ago. I also mention, later in the book, that a draft exists. If it did, it is long gone. Here’s the basic premise: scientists have found that one unexpected consequence of a changing climate is increased predation of ground-dwelling bird eggs. The culprit? “Active, hungry snakes.” For me, this alone was enough to fully ramp up my commitment to living off the grid. I feel that all of the environmental orgs and activists have their messaging all wrong. They should just show us lots of pictures of active, hungry snakes. That alone could drive sales of electric cars through the roof. Now you know. Check. Done. To make a smoothie, I use water (about 2 cups) because it is free, some chia seeds, about a tablespoon, that I try to soak in the water for at least five minutes, usually a banana, maybe three leaves of kale or sometimes some spinach which is sweeter. I add about two tablespoons of raw pumpkin seeds and sunflower seeds, sometimes some raw cacao, or avocado if there is some that needs using up, then I add whatever kind of fruit I have. If I have something fresh that is close to going bad, I use that. If not, I use whatever is in my freezer and I try to keep that stocked. We do pick-your-own and freeze (I like a peach/blackberry combo) and I buy frozen fruit at Trader Joe’s. I fill the blender up all the way (leaving about an inch or so of air at the top), blend, add more water if I need to, and pour a quart of the resulting chunky, greenish sludge into a mason jar and drink a glass a day for about three days and then start again. Done. Probably not. It’s possible, but the whole superhero terminology is not working for me so the exercises are likely to pop up somewhere, but not in this format. What about the novel? And the songs? I am committed to finishing the novel, and I know that I have more than one inside me. I am torn (pulled, uneasy) about starting another project, one that is not the novel, first. Toni Morrison wrote Beloved as a single mother, waking up at 4 am, before taking care of kids, before work, to write the words. It is possible to fit a novel around other things, around life. Then again, there are always trade-offs and you have to decide which you are willing to make. If I were still at 80,000 words I would finish the novel now. But I need to do something that gets my work out into the world of other people. I need to have an outlet for sharing something now and I need to have a map for myself to guide what that sharing is organized around. My hope is that I can launch the book, then turn my main focus to the two projects, and develop a rhythm and routine, and maybe some relationships or some kind of reputation, that will help create the conditions to allow concentrated time to move forward with the novel. Maybe you can tell that I don’t know what I’m saying exactly. I’m going to finish Stuffed, I’m going to submit my other writings, and I’m going to finish the novel. I’m just not sure about the order. I want to finish the Jenny Goodguts book first, and then I want to be open to life happening. Someone advised me once that my writing is better than my songs. I don’t know if that is true. Maybe so far. I think they are two ways of doing the same thing and I love them both. I’m not giving up on the music part. I promise myself that. I was rude. In the middle of his sentence, I fumbled around for a pen and scribbled an urgent note to myself (he’s a writer, he understood). I noted that January is the time to make holiday plans. Of course! It seems that every year in December we smile (our eyes slightly twitching) and joke with each other: Have you gotten everything done yet? And we look forward to/complain about time spent with whichever holiday companions we may have. And we take solace knowing this time of year is difficult for everyone, fun, festive, difficult. That’s just how it is. We spend weeks or months preparing and we schedule or buy as much festivity as we can fit or (sort-of) afford. Maybe we is not the right pronoun. Maybe it’s just me. It doesn’t seem like it, from the time I spend with others, from the conversations I have, from the advertisements I hear or receive in the mail. I feel surrounded by messaging telling me that I’m supposed to feel overspent (in all ways) at this time of year, that’s part of the tradition, it’s okay, we’re all in this together. And November always creeps up on me and it’s too late. It’s too late to make a different plan, to change course. Because it isn’t just me. I’m connected to others and they are way more organized. While my friend was talking about the things we do that are predictably difficult, and often unnecessary, or the things that are necessary but are adjustable, where I can behave differently and there might be a different outcome, or a different feeling in me or in those around me, I thought: why not spend some time, in January, to consider, to make some notes. To write a letter, draw a kind of map, thinking about what you loved, where you found light, where you shared light, and where you felt its absence. When did you laugh? When did you make someone smile? When did you feel peace or make peace and what were you doing and with who? If things went seriously downhill on Christmas Eve because you needed to get some food into your kids before church and that caused some memorable unpleasantness, you could make a note: remember to plan time to eat accounting for Christmas Eve church schedule. If your husband gave himself a concussion or your sister had strep throat, or both at the same time, I guess you can’t really prepare for that, but you could make a note that nothing will go according to plan and there will always be more to do than you thought, encouraging yourself to let go of some expectations or plan less or do more earlier (no, not this). Or just write the words “leave space for life” and maybe that will help. Maybe it will. Note: Christmas idea does not refer to a soulful thought about peace on earth or goodwill toward men. It refers to an object, or possibly an experience (but usually an object), within a particular price range (price range determined based on the individual from whom the note comes). Christmas idea, in my case, refers to one idea per family member (myself, husband, two children) per requestee. Anyone who has requested Christmas idea signifies the need for a requisite return idea for members of that household. Additionally, a number of others who do not request idea but provide wrapped object also warrant their own Christmas idea and so it goes. Thus, the tougher part of my brilliant plan involves some kind of discussion amongst those with whom you celebrate The Holidays. Yes, now it comes to talking about the gift part. My beloved people, can we talk about the gift part? Acknowledging that elements of this can be fun and that I love my new sweater (the one I selected but did not pay for), I want to lovingly communicate that the parcel parade, in its current manifestation, is hard on my soul. I wonder if it is selfish of me to mention this, to raise the question. Maybe recognizing that your buying things — or experiences — and giving them to me (or my offspring) is something you like to do, I should connect to your heart, to your light, and appreciate the love behind the gesture. But if my daughter doesn’t want to be kissed, I teach her that she can tell you that. She can tell you what feels good to her and what feels not good to her. And you listen, because that is respect, that is connection. You care enough to listen and try to understand the kind of giving that makes her feel given to, considered, understood, and the kind that feels the opposite. My dear family and family-like people, I think we love each other enough, we have known each other long enough, that I can listen to you and you can listen to me. My soul and spirit feel good when you smile. When you wash the dishes after I have cooked something. When I make you laugh. When we make a puzzle together. When you listen to me or ask me questions about things you know that I care about. When you play with my children so that I can take a shower. When you do something silly, just because. When you turn on music in the kitchen. My soul and spirit feel good when we help someone. When we make a plan together to do something caring for someone else. When I see you building a relationship with my kids, when I build a relationship with yours. When you teach Maggie how to knit. When you make me a breakfast sandwich. When you do the best you can. When we all pitch in. The wrapping and unwrapping, the quantity of things and paper, the lesson to the children about what has meaning or where we find joy, the packing or shipping, the number of decisions, the more-than-enoughness of it all, exhausts me. It saddens me. There is less room for spirit. I try. I want to show you love and share it. But I am so tired with all of the thingness. We need more smiles. From you. To you. With you. From us. To others. To the world. Can we celebrate light by sharing light? Can we share light where it is most needed? Can we do that together? Can we let go of the thing exchange, or change it? Through our example, through what we emphasize, where we put our care, can we teach the children to value relationships and time spent with loved ones rather than emphasizing the brief thrill of another wrapped surprise? Another acquisition, another division of what is mine and not mine. What they need, for their happiness, for their spirit, is to learn how to find connection in the world — can we help them learn about finding joy in people rather than in cataloguing and comparing and protecting and admiring their stuff? Maggie loves that donut pillow, she sleeps with it every night. And the Birmingham picture and sign, the garden seeds and the beeswax candles, and the sweater that I picked out for myself but would never have purchased on my own dime, these represent love and I feel it. So I don’t know what I’m asking exactly. We are fortunate to have people who care, people to spend time with. I can’t seem to find a model that fits. I’m not looking for a day-off-work, get drunk at breakfast kind of day. I’m not looking for an all-pious, Jesus’s birthday kind of day. I’m not looking for a kale salad, experience-gifts-only where the depths of your creative thoughtfulness are the measure kind of day, that is exhausting too. I like our way. Sort of. But I don’t want to spend December shopping and wrapping, shipping and organizing. Is it okay for me to express that, to feel that? My beautiful, emotional, sometimes dramatic family (and family-like people), we did just fine in 2018. If we had been sailing in four separate lifeboats, and for a few days the loads of all of those boats were tossed into one slightly larger boat, almost big enough for everyone, and the sea was rough but not so rough that it completely drowned anyone, in the midst of sogginess we worked together, finding places for everyone to sit (when they absolutely had to, but only then), sharing vests, raincoats, snacks, so that we all made it, and there was a little bit of laughter, or at least sometimes a feeling of rowing together, and the kids will remember it fondly. But this year, before we all pile in together, maybe we could find a way to pack differently, pack less—so that our boat can float a bit higher, so there’s more space. I’ve made my notes for next year. I’ll bring the puzzle. This piece is part of The Stuffed Project: One woman’s quest to reimagine our relationship to the material world (working title). You can learn more about The Stuffed Project or subscribe to get updates in your inbox. I will begin 2019 with a link to Emily McDowell’s toast to the old you on Instagram which echoes what I believe: you don’t need a new you—love the well-worn book you already are. My children have been back in school for five hours and 38 minutes. So much to share, not quite enough time. First book coming soon! I am soon to (self)-publish my first book The Rise and Fall of Jenny Goodguts. Cover art is in final stages and I am hoping to be ready to launch by February 1 (stretch goal). I think it has turned out beautifully and I cannot wait to share this book with you. 100 Rejections: Still sitting at 2 submissions, 0 rejections. Stuffed Project: Three posts written and shared. So far it seems like I’m on to something. A lot of comments and more sharing than usual (especially This little light of mine). Since beginning the project I have been observing all the times when objects are introduced into a perfectly amicable situation and—voila!—mayhem ensues (this is applicable to adults as well as children). I have been reading the book The Gift by Lewis Hyde. He distinguishes between a true gift and a transaction and this has been eye opening though I don’t yet have an articulate way of explaining what I mean. I’ll finish the book first. Report card / promises / letting go: Over my four years of blogging, I have promised a number of things. In the near future (note, another promise) I will provide a report card on promises kept, commitments of future work, and changes in plan / the promises made that I am going to let myself off of the hook for (I don’t think you’ve been waiting for them all this time, but if you have, you can let me know). My word for 2019: Finishing. Here we will walk down memory lane and take a look at major creative milestones, in reverse. I’m going to go back to 2017 because I have a number of new readers and I’ve never done this before so there is no 2017 round-up to look back to. Dec 2018: Began The Stuffed Project, a theme I will explore and write about over some period of time, culminating in a book. Through this project I aim to develop: a joyful appreciation of the material world as reflected in my daily life; clear criteria for decision-making, to dispel exhaustion in the face of hundreds of daily decisions about the stuff I/we are managing; a way to consider obligations, including the obligation of organizing, acquiring, disposing of all the stuff, that restores time and energy for living. My approach is to bring some lightness and humor to the subject and think about it in new ways, not to get too heavy, or focus on harm and doom. Dec 2018: Launched The 100 Rejections Project. While writing things and hiding them in obscure places on the internet is a very enjoyable and valid way to practice, sharing the things I’m writing more widely is something I feel ready to try. I don’t expect rejection, but at this point learning about submitting itself is a huge win for me, that is where I am in the learning process. I also do not have relationships or a reputation in the publishing world—yet—so that is something we build : ) Also, I like games so this way it is fun for me and also something I can share with you. Dec 2018: Told a wise friend I was planning to finish my book (Rise and Fall) and then just “put it out in the world and see what happens.” She told me that is like saying you’re finished being pregnant at 8 months and she insisted that I have to come up with a plan to share it. She’s right (so I asked for her help and she said okay). Dec 2018: Submitted an essay (my first) to The Sun. Nov 2018: Commissioned cover art for The Rise and Fall of Jenny Goodguts (versus designing myself as had been the plan). Oct 2018: Submitted my writing for publication for the first time as an adult. I sent one poem to The New Yorker. I think it is a good poem. I also wanted my first submission to be to The New Yorker. Probably because of E.B. White. If you have never read his essays, may I highly recommend One Man’s Meat or Essays of E.B. White. Sep 2018: Enrolled in Seth Godin‘s The Bootstrapper’s Workshop with practically no forethought other than having read his daily blog for the past four years. Met a lot of interesting, thoughtful, supportive people who helped me to feel braver and more ready than I thought I was. Wrote a lot, learned a lot. Jul – Nov 2018: Spent hours, days, reading my published and unpublished words from the past four years. Saw some patterns. Noted the number of things I kept saying I would do or write about someday. Noted that Stuffed, for example, was something I’ve written about writing about since November of 2014. Can’t decide if I never gave myself permission to do the writing, if I had other priorities at the time, or ??. Jun 2018: Accidentally deleted 50,000 words of my 80,000-word novel draft. Not recoverable. Devastated. Shortly thereafter, notably while writing about it, was honest with myself about priorities, saw more clearly the importance to me of the work I had been doing. Thereupon decided to pursue the Rise and Fall book which I am so glad to have done. I did not know that Rise and Fall would take quite so much time as it has, but I’m glad I made the decision to put the time in and I’m proud to have followed through. May 2018: Eating and other problems is incomplete but writing it was very important for me. This was when I felt (not thought, but felt in my body) that I have spent too long living in the story of how humans cause damage to the Earth and focusing on the details of the damage caused. I want to focus on how we love the Earth, how we love each other. This does not mean ignoring information and it doesn’t mean turning away from what is hard or scary. Love can be, is often, hard. But it feels different than fear, avoidance, or wishing. And it is active. Mar 2018: Writing When Bono saved Easter also shifted my perspective on life. This one is a very appropriate New Year read and may help you to rethink the New Year, New You claptrap. Of everything in this 2018 review, I think reading this one may give you the most hope, or acceptance. I love this piece. Jan 2018: I wrote my most popular piece of writing, to date, How to lose 10 pounds in 10 days. It is funny. But I will tell you a secret. The reason it has so many views is that a friend of mine has about 10,000 Facebook friends and she is a revered wit. She shared the piece saying it was “hilarious” and almost all of the views and comments came from her friends. As an emerging artist, this is tough because what it suggests to me is that my humorous writing is the most marketable thing I have going. And I love to write with humor. But not all the time. It’s tricky because people want to know what to expect. So, here’s what you can expect: I frequently write with humor, but sometimes I don’t. Nov 2017: Successfully extricated myself from annual post-Halloween sugar-fueled emotional slump. Blogging helped. Oct 2017: Began writing my still incomplete, mostly deleted but not abandoned novel. This was an amazing experience (even considering the mishap). My writing improved, probably because I came to understand what it means to sit with your paper or your computer and listen and translate words that are not crafted only by your own mind, to be a conduit. I also learned that the act of sitting and writing, itself, is asking a question. The answer doesn’t necessarily come while you are writing but the act of writing down the words helps you to understand what the question is, where you don’t yet know something. And then, sometimes, an answer comes first thing in the morning, or in the shower, or washing the dishes, or driving and listening to the radio. I look forward to granting myself more time to do this. Oct 2017: Posted a song I wrote while thinking about how to keep going when people you love are hurting and the world is feeling dark. I’ve written about 20 songs and this is the only one I’ve shared in this way and only in voice memo format. Also I was sick when I recorded it so in my opinion it is not my finest vocal work. I’d like to record this one and some of the others in a more listenable format and I’d like to do it in 2019. But right now it is an aspiration and not a plan or promise. This is #2 in terms of my most viewed post ever. So again, not sure what to draw from these small slices of data. Comedienne, songwriter, poet, hybrid? I’m still going for hybrid. Sep 2017: Wrote How to find your life purpose and How to make any decision. I love both of these pieces and the first one marked a shift in my voice and style of writing. Aug 2017: I wrote a lot around the time of the violence in Charlottesville but none of it is posted on the blog. Some of this writing made it into the book though, so you will be able to read it there. I did share one piece on the blog, I may be right, I may be crazy, that my dad (who is usually one of my biggest fans) did not care for. I think is a helpful read for someone who is aching to be creative but afraid. I think I was on the cusp of jumping towards writing more honestly and authentically but of course I didn’t know that yet. Jun 2017: I wrote the Happy Atmosphere Challenge after President Trump announced the US would pull out of the Paris Agreement. It could use some refining and I have new thoughts about it in light of a year and a half of more thinking. It was an important exercise for me, I think it is a good read. Refining and sharing this in some way is one of the projects I am thinking about within the context of Finishing. May 2017: Launched the Adventures with Jenny Goodguts blog. Wow — it hasn’t really been that long! I love the launch post Not holding out for a hero and the explanation about the origins of Jenny Goodguts, even if I’m not using the superhero terminology anymore. April 2017: Found a lucky quarter—face up—in the Trader Joe’s parking lot. Made a spreadsheet. Life changed. After writing, and rereading this post, I reflected a bit. I asked myself, do you think the work here is the best you can do? Is THIS how you want to be known to readers? And I smiled at myself, inside. Yes, I said. This IS the best I can do. Today. That day. And I did it. And I shared it. I don’t know what is the best I can ever do, if I get more time. If I stay healthy. But I’ve done this, and I’ve learned, and I’m learning. I’m practicing and I’m trying. Thank you for reading and for your encouragement. Thank you for helping me to find my voice and share it. Thank you for bringing out the best in me. In Adventures with Jenny Goodguts, I share progress and notes on a variety of experiments while trying to become a published author, reimagine my relationship to the material, and sing a lovesong to the world. I share about one post a week (historical overestimate). Subscribers occasionally get extra news and notes. You can subscribe here. Before you cross the threshold into our often happy home, I want to celebrate that you have met the Hole Family joy/usefulness criteria. You are so welcome here. I will happily trade some of my precious life energy to care for you, to maintain you, to appreciate you, to make sure you return to your own little space, your special spot in our abode, the one where I always know just where to find you. Thank you for all you will do to brighten our lives, nurture our spirits, lighten our loads. You know, it isn’t any old thing that makes it across that doorstep. True, lately many leaves, more than you might expect, have found their way in, uninvited. These we put into the compost, returning them to their friends, a mutually agreeable outcome. One. Do we need it? Will [object] bring joy or likely more aggravation? Do we already have something else that can be used to the same purpose? Do we need a new [object] in a theme/color or can we use a [similar object] we already have? What else could I do with the time that I will not spend looking for just the right [object]? Would it be nicer to take a 30 minute walk and talk to a friend or to store another set of holiday-themed [objects]? Two. Could I borrow an [object]? Three. Is there somewhere I can find an [object] in need of a good home? An [object] that already exists? Can I pay someone who is selling their gently-used [object] instead of buying it new? Four. Is there someone awesome making beautiful [objects] who is trying to make a living through making great [objects] thoughtfully? Can my purchase support more creations by this very cool human being or organization? And if it costs more, did I perhaps save some money by asking question #1 so many times that now I can spend a little bit more to support someone putting beautiful, thoughtful, healthy [objects] into the world? Wouldn’t it feel good to see a beautiful, useful [object] in our home and feel the joy of connection to its maker? Five. When I am finished needing [object], am I willing to take the time to respectfully transfer it to someone else who can use it or return it to Mother Nature in a way that does not harm humans, wildlife and the water, air, and soil that nourishes and nurtures our lives (all life)? Or do I already have so many [objects] that I’m maintaining that I struggle to recirculate them and/or their materials when I have finished using them? I love you, beautiful object. You keep me warm, you keep me healthy, you teach my children, you give comfort, you remind me of loved ones, of happy times, of connection. I am so happy that you have joined our family. I will treat you respectfully and appreciatively for as long as you stay here with us and I promise, as a respected member of the family, that I will take care to give you an honorable discharge when your time with us is done. You will not fester underneath wasted, rotting food in some huge methane-producing landfill or end up in a turtle’s belly in the sea. I know you may have questions about some of your roommates and I can only say that many of them were acquired “before” which could refer to 100 years ago, which is cool, and also sometimes difficult. Criteria to address the stagnant pools of life energy collecting all over the place will take a lot more doing. And these criteria will too. Anyway, glad you are here. I will find a home for you once we store all of the Christmas decorations back in the attic and find new homes for whatever other [objects] appear festively wrapped under the adorned (yet decaying) tree of communal object-exchange. I’m so sorry. I know it is no excuse, but I’d like to give you a bit of background to explain. Spur of the moment, and uncharacteristically, I decided we should go see the lights at the National Zoo on Tuesday night. Something fun, festive, and free to do as a family. I didn’t remember Memorial Bridge was down to one lane. I didn’t reckon properly on the rush-hour traffic. So we showed up to the zoo after 6:00 pm, with two hungry kids, two hungry parents, not quite enough gloves. We walked up the pathway – as members of the zoo we were eligible for free parking, a pass for 10 free rides, and a special gift, while quantities lasted. I had already decided that we would not need the free gift, whatever it might be. We approached the member station. The first thing my girl child did was to complement the zoo lady on her brightly flashing bumpy ring. “I love your ring,” she said. The zoo lady did not seem moved in one way or another, I don’t remember her responding at all. But she did reach over to get our free gift, a zoo tote bag containing our 10-ride pass and four individually wrapped bumpy rings. You were one of them. I told the zoo lady, as rehearsed, no thanks, no free gift needed. “You sure?” she asked, gesturing to the bag’s bottom where I saw the rings, so small, and remembered the girl child’s words, and thought, hey, relax, a couple of little rings will be fun. I took out one for each child. I pressed the buttons to start the batteries and we were off into the light-filled night, fingers blinking in delight. As the children walked down the path, playing with their rings, I looked at the lights. “Oh, look, icicles,” I said. It was cold. “Oh, look, a seal riding a bicycle, a wolf wearing sunglasses, a polar bear eating a sandwich.” They turned the rings on. They turned the rings off. They turned the rings on. They…. And then, little ring, your time was done. Your battery either destroyed or some malfunction. Your seven-to-eight minute life span of functionality over forever. And the boy child was inconsolable. “Look – it’s a penguin wearing suspenders and jumping through a hoop of fire!” The ring was broken! “Look, glittery sparkles lighting the night” It’s not fair, that boy has a necklace of lights, I wanted the necklace of lights instead, like he has. “Smell the funnel cakes, listen to the choir singing” Tears, snot, refusal to walk, sister pretending she will give brother a turn with her ring and then not doing so, second ring confiscated and put into pocket to not cause conflict, tears, snot, cold, requisite family photo. Waiting in line to spin too quickly in the cold night air next to the girl child, I overheard another boy whose ring had broken. He too was full of sorrow at his lost joy. Small squishy green ring of silicone, today I performed an autopsy. Your tiny light source made from rare earth materials, your petite battery to power the tiny light source, your bumpy green shell made from silicone, otherwise known as hydrocarbon-transformed quartz. I think about the giant sculptures we saw at the zoo last year. Huge, larger than life, made from garbage that had been removed from coasts of oceans around the world. It was an amazing exhibit, shared with us so we could think about the things we are putting into the sea, that don’t disappear. And here, at Christmas, that same zoo is putting little packs of sea trash into a bag so that kids can have a worse time not paying attention to the experience but, instead, focusing on a new “thing” that they were not in any way expecting to get when they came to the zoo. It would have been cool to walk around and see all of those lights. But you, little ring, became the focus, a source of friction and discontent. And now, you are a piece of garbage, which you were always destined to become. Michelle says: Adds a lot of fun to any party. We will be using them for a night time beach party this summer. Deb, who gave your brethren only three stars, writes: Bought these for a rehearsal dinner. I lit them up ahead of time so they’d look good on display and draw attention. By the time of the event, several rings only had 1 or 2 LEDs flashing. I was disappointed that they didn’t last longer. Would have been good to know life expectancy ahead of time. They were very popular though and people loved seeing the ones that worked and picking one to take home. Will also provided some helpful perspective: These were so fun and really quite bright. For the price they were really great. We’ve used our set on 3 separate occasions and all but one ring has worked each time. The on-off button works pretty well and I love that it is squishy. Squishy one, you won’t biodegrade. So I can either throw you into the trash or add your light and battery to my growing bag of electronic-related waste to take to the special dump for that kind of thing. Maybe you can be recycled into something that will provide a more lasting light. That is my hope for you. Just imagine, maybe you could be part of a spotlight lighting a little girl for her first violin concert. Or a light at a hospital, where a new mother is having a life-saving surgery, or a studio light where someone is painting a vision of a world where everyone has enough to eat. I learned my lesson little ring. I promise to find a way to recycle your components because it wasn’t your fault you were made this way. There are bigger plans for your future. I loved those trash sculptures, but I don’t want to see you end up there. Thank you. Thank you for teaching me an important lesson. I’ve learned it before, but maybe it will stick this time. Focus on the experience. Introducing an object, a new thing, into the equation almost never adds. Almost always subtracts. The kids remember the rings, the tears, not the lights. So here is to lasting light. I want you to know that I love you. We dreamed of having you for a long time, but it was so hard to let go of your predecessor (who will receive her own letter in time, but since that is a break-up letter, it is more emotionally complex). I love that your springs are intact. That my feet don’t leave the ground as my tired derrière slides towards the pit at the back of your cushions. You have no pit. May I long protect your integrity as a couch. Sofa, I love that you are big enough for three people, four good friends, or up to six children to sit comfortably upon. It is nice to imagine inviting a friend over for a cup of tea. I know I’ve been promising something like this for a long time, and someday it will be more than just a dream. I apologize and recognize that you were not sold as a trampoline. I am working on it and he will get older. We, you and I, will be happy that he is older. And also sad. I think we will both miss the jumping. Thank you, dear sofa, for sheltering my body, covered, and uncovered, and covered, and uncovered with that sleeping bag when I could do nothing but roll into your embrace and hope my children didn’t pull the knives out of the knife drawer while my husband was away and I had that undetermined dread virus last winter. I will never forget those 24 hours my dear friend. I am so glad, so thankful, that your cover is washable. I promise that someday I will remove the old chocolate from your corner, the orange marker, deposited to your main cushion the very day of your arrival/assembly. Today will not be the day. But it will, eventually, come. I remember when we met you, just three separate cardboard boxes too heavy for me to lift but that somehow fit into the back of our SportWagen. And now here you are, a part of the family. Sofa, I know that you were once a towering tree, cleaning the air, feeling the breeze. That your cover is made from plants that felt the sun and drank the rain. That your joints came from within mountains, your stuffing from aged dinosaur bones. I honor your provenance and will do my best to treat you with the respect due to your sacred heritage. May I take one moment, each time I rest upon your Flodafors beige threads, to cherish the comfort that you provide to me and to my loved ones. I know the jumping is ill-advised. And you need a bath. You see heartbreaking videos about palm oil and chimps, read about ice sheets crumbling and the link to your daily commute, or some girl at Starbucks gives you the evil eye for using a disposable straw. Maybe you should have remembered to bring your cup but you live in suburbia juggling children, work, parents, community, broken appliances, holiday prep. So you buy things on Amazon and feel guilty/remorseful afterwards when the local toy shop goes out of business. Unless you stop living, you use stuff. But you are surrounded by messages that the stuff you use is damaging someone or something else. You feel bad for wanting things, for buying things, and for feeling bad about the things that you’ve wanted and bought. And it is piled up around you, you spend so much time sorting it, moving it, organizing it, donating it, replacing it, repairing it, arranging it, selecting it, wanting it, not wanting it. You know you can “vote with your checkbook” for the kind of world you want. But it feels like each choice takes so much effort, so much research. So you vote with your checkbook at The Container Store. Your child asks you what a Pez dispenser is and you tell him it is just a piece of plastic that will turn into trash, and some sugar pellets. You overhear yourself and know you are no fun. But you’re also right. Your parents are/soon will be downsizing or no longer able to maintain a lifetime of material accumulation. And they are even more attached to things than you are as evidenced by the hurt look on the maternal face when the offer of a silver-plated candy dish, a wedding gift unused since the 60s, is politely declined. And how many conversations will you have about that broken candelabra? I know it was your mother’s. I know. Something will need to be done with their stuff, and the thought of all of the decisions – and emotions – is difficult. Holidays come that are focused on buying stuff, giving stuff. Most of the people you know have more than enough. And you know that lots of other people don’t. But, in the name of love, you buy your parcels and wrap them. It feels fun, sometimes, (stressful and expensive, often) but you also wonder. What is the lesson to the little ones from all of this getting and giving? Giving is a fundamental joy of being human – can we do it differently (but, not just substituting with homemade certificates for quality time)? You have read or heard about numerous clutter-clearing strategies and tried to KonMari your home but the birthday party favors never stop coming. You are also somewhat uncomfortable with the ethos of just getting rid of what you don’t want to purchase different stuff, recognizing that every object equals nature transformed, life energy spent. You aren’t going to give up your trash can, but could there be a benefit, some joy dividend you might gain, from creating less trash? You want a balanced, joyful relationship with material things, not the possibility of a nervous breakdown every time you walk into the basement. And it’s not just your home and storage spaces that are overflowing. Your schedule, mind, and list of shoulds is rammed full too. You may vacillate between super healthy/restrictive eating and binging on cheese and crackers or Quadratini Dark Chocolate bite-size wafer cookies. And yet, in the light of all of this over-fullness, there is a feeling that something is missing. Maybe you need to redecorate. Maybe you need to minimize. Maybe you need to spark joy. Hi, I’m Jennifer, and I’m on an adventure to reinvent my relationship to Stuff. Do I have any guiding principles in this work? Yes, thanks for asking. I am looking for joy and light. I will not focus on the harm done through acquiring and using stuff, but will look to describe a relationship with the material world that is connected and life-affirming. Are millennials doing stuff differently? The growth economy – do we need to buy more stuff to make more jobs? Hasn’t a lot already been written about stuff? There is great work out there on these different topics. I want to explore what’s been done, what is helpful, how it works in real life, in my real life. My current plan is to read a lot, to do experiments with popular stuff-management approaches, to write a mix of personal essays, notes on history and culture, and a bunch of letters to my stuff, and hopefully write a few songs on the nature of glow sticks and Chuck E. Cheese. I want to shine a light on good alternatives and help you to see more beauty and feel more connection to the world through stuff, but less of it. I am really excited about this project and I think it is going to be a lot of fun. I also think – I hope – that it can be healing, because the guilty feeling, and occasional paralysis, that accompanies your choices is weighing you down to the ground. Because you don’t want to spend all of your time organizing, curating, making decisions about all of the STUFF that surrounds you, but the indecision, lack of clarity, and conflicted values that all the stuff represents is draining your life energy. So I’m going to chat with you about it, to help you laugh about it and think about it in new ways. I’m not going to get too heavy, focusing on harm and doom. You can trust me, because I understand a lot about harm and doom, I promise to be a thoughtful and thorough advisor. But I’m not going to get into the nitty gritty of what is hurting the world and how. I’m going to talk about how we can protect and restore and nourish and love through more connection, not more information. I will be an understanding friend, not a purveyor of judgement, I will talk in real language about real life and not an idealized, spiritual nirvana. So that’s the plan. I figured December is the most Stuffed month of the year, a perfect time to announce my intentions. Sign up for updates to learn more about this project (and my others) and to learn with me as I go. The plan: I am setting out to collect 100 rejections. Timeline: We have to be flexible in life but I’m thinking four years which equals about two submissions per month. Parameters: I have to submit the best work that I can*, the objective is to have my work accepted. By celebrating each rejection, it makes it easier to try, it adds a fun element to the trying, there is victory in defeat, which isn’t even really defeat but a stepping stone to the next thing, a way of learning, and so much better than just sitting here wishing. * With respect to the best work I can, I can’t just sit on something for three years because maybe I can make it better someday. I have to finish a piece to the best of my ability and send it off. Not all of the perfectionism(ing). Types of submissions: I have written pieces in mind. But I will be flexible. Anything that I am willing to put myself out there for and risk being rejected can count as a rejection. So, once my book is ready, if I go to a local bookstore and ask them if I can do a reading and they say no, that’s one rejection. So it is feasible that I could get to 100 a lot faster than four years. When will I start? Well, truth be told I’ve already started. I submitted my first piece, a poem, to The New Yorker in October. I sent it off and felt very excited, immediately, about getting my very first rejection, and it being from The New Yorker. I am looking forward to printing that email and putting it into the empty spot on my wall where right now there are no rejections because I have never submitted my writing to anyone for publication. Not true. I had a poem published in junior high. I also had a few poems published in high school. The junior high poem, about cats, was cute. The high school poems were embarrassing, not because they were bad (they were) but because they were thoughtless, insensitive, just flexing my clever muscles and nothing else. I have had other writing published, but always because I was employed by a company to write something for their in-house publication. How will I track it? You know that I already have a spreadsheet. What will change between now and the one hundredth rejection? I don’t know. I’m excited to see. Can I submit the same rejected piece to a new place? Huh, I hadn’t thought of that one. Seems like I could get to 100 pretty quickly in that case. I was thinking I’d have to write at least 100 different things but of course that isn’t true. If I wrote just one mediocre thing and submitted it to 100 places that would do the trick. Well, let’s stick with 100. It’s a nice-sounding number. If I get to 100 and haven’t learned something interesting then we can make it the 1,000 rejections project, or some other number like Charles Dickens’ birthday or something. Okay, I just googled E.B. White’s birthday, July 11. So if 100 turns out to be a cinch then maybe we’ll go for 711. But perhaps we should just get started? Most publications don’t accept submissions that have been previously posted (even to little-known blogs) so I cannot share my submissions here. But any published work I will certainly celebrate (possibly even more than I celebrate each accumulated rejection) and will of course share with my devoted readers as soon as they are available to share. It’s been four years, and a few days, since my soon-to-be published book, unimagined at the time, began. Five months since I lost my 50,000 words, folded up my checklists, became a routine coffee drinker, and started taking a closer look at what I’ve made, what I’ve promised (to you and to me), what I’ve learned, and what is next. When I started to blog in November 2014 it was the only feasible creative outlet that I could imagine. It was something I did on the side, in tiny pockets of time that felt borrowed from other responsibilities, slightly embarrassed, apologetically—an experiment. Starting the novel, and devoting significantly more time to writing, though still very much on the side of the other responsibilities, still a guilty pleasure, was another experiment. Can I do it? What will it be like? But after all the experiments, failed, embarrassing, or otherwise, documented in these pages, I find that I can no longer imagine a life where I do not write. So many of the pieces I have written have changed me, the way I see life and myself. I can recognize, now, what is my voice and what is not my voice, when I am saying the things I have heard and when I am saying something I feel to be true. I have felt a connection to something outside of my own mind that if I open to it will move through my hand onto a page. It frequently does not feel comfortable, but sometimes it can feel like witnessing a miracle. It has been interesting to watch the process where my mind recognizes something new: I don’t need an empty notebook. I’m not an empty notebook. Integrating a new understanding into how I live my life, watching how that changes interactions, or my feelings about myself…Well, I can’t say for everybody but for me it takes a while and I’m learning to be kind to myself: Remember? You’re a dog-eared notebook. It’s cool. The would-be break-in piece, written in October 2016 but never published on the blog, marked a big shift for me, in life and in writing. I can see that now, but I didn’t know it then. I think the ideas in Lemon vs. Knope were also very important: stop focusing on your foibles and flaws as the most interesting things about you, embrace your inner Knope—it is okay to express love, enthusiasm, and not just for things that don’t really matter, like hot dogs. Writing the Happy Atmosphere Challenge was also important (if overwhelming), and that experiment will certainly inform my future work. I learned that motivating to do less bad feels very different from motivating to do more good. I am loathe to make any promises here, having seen so many in these pages that are still not fulfilled, but I think it is safe to say that you will be reading more about Do More Good in the near future (or at least safe to say I will be writing about it). Writing Happy Atmosphere also started me down the path of learning something else I want to think/write/share more about soon. The Challenge is filled with SO MANY THINGS to think about, to measure yourself against, to monitor. Maybe it feels good to have a large menu of possibilities. Or maybe it is better to say, hey, change these three things, they make the biggest difference, and then live your life where you are, be flexible, relax. I haven’t written this one yet, but I look forward to learning this lesson. The piece called Piggly Wiggly, and more pieces where I consider race and my southern heritage, were things that I wrote about but never published to the blog. The Piggly Wiggly piece was a draft in August 2017, right after the violence in Charlottesville, and a reasonable amount of the thinking, and the conclusion, were done more recently. I don’t feel qualified to write about this. I don’t feel free to write about this. I feel scared to write about this. But the conclusion of that piece changed me. I thought I had loved people, but after revisiting, editing, and considering this piece, I don’t know that “love” is the right word. I had loved in a child-like way. But now I am an adult. I think love is more active, more interested. Feminism, Me Too. I have written a lot about this and unlike Piggly Wiggly not a single one of these pieces has made it into this book (well, maybe that one bit about the patriarchy). There is so much to be said, and so much feeling and anger circling this topic. I haven’t wanted to get involved in the middle of that. But I do have a perspective, and writing, even what I have not shared, has helped me. I’d like to share. I think I will. Basic Training. I don’t know if I would have managed to write the things I did, to grow in the way that I did, without Basic Training. When I am hardly drinking alcohol, eating very little refined sugar, not on Facebook/playing iPad games that surge my neurochemicals, I’m energized, mostly positive in outlook, patient, and many other things that I like to be. Add meditation and eating veggies with some regularity and I’m positively pleasant to be around. But there is a fear that goes along with all of this normalcy. What if I can’t keep it up? What if I get back in the bad place? So my flexibility dries up. I am steady, but possibly less joyful. Basic Training was a huge benefit because I got to see the balance that could come from some different, regular habits and I could assess which ones were most helpful. I needed that. But I don’t have to LIVE there. I want to learn to walk the line of moderation. Enjoying things, but not overmuch, eating cheese and knowing that it will be okay, skipping a week of meditating and then starting again, living in the flow of life. But I think it’s important for me to have some basic guidelines and principles and to know that, if I want to do the work that matters to me in the world, if I want to be awake to life as it is today, if I want to have experiences with my kids where I share my spark with them, I need to mostly moderate. Checklists can work for me. Checklists with love and flexibility. Bono. I think this is the best piece I’ve written to date. I don’t know how other writers work, but what I like about the act of writing, and about my writing in particular, is that I’m not out to teach you something, I don’t have an ending that I’m trying to convey, I’m not trying to convince or persuade. I’m trying to understand something myself and sharing my questions and the answers that I find, that are in process. The exercise of writing this piece was truly transformational for me, for my understanding of myself and of life. Eating and other problems. I know this one is heavy, and incomplete. But I’ve included it in the book because, again, the process of putting this down on paper totally shifted my perspective. For twenty years, instead of singing a lovesong to my home, instead of embracing, and celebrating, and shining a light on beauty and connection, I have fretted about tablecloths. I have seen life as damage. Hard to write, hard to read, possibly confusing out of context here. When I read these words back to myself, it kind of knocked me over, imagining myself as my own child, learning about how people live on the earth, our relationship to it. I guess I will spend a lifetime figuring this out, but it has stayed with me every day since writing it. I want to sing a lovesong to the world, I want to know what I mean by that. This feels like it has become a basis for what comes next. And what about Jenny? I thought Jenny Goodguts was separate from me. An ideal—a superhero—that I aspired to be closer to, more like. Someone who always knew the healthy choice, someone who held me accountable to being my best self. I felt that I could never quite meet her expectations, and I felt a growing frustration with her inflexibility, with her constant judgment of my behavior. I felt she was watching me, saying: you’ll never reach your potential if you keep not following my advice, if you keep falling short, if you keep slipping. But Jenny Goodguts never said those things. I thought that Jenny Goodguts was the me I could become if I could get my act together, fix all my habits, make a plan. I was wrong though. I tried to send Jenny away, but I don’t want her to go away. Because she’s me—I’m her, of course. The person who knew to tape the quarter up on the kitchen wall, to make a game, that was me. Was the same me that sometimes raises my voice and feels bad, or who is sitting here in a magenta hoody sweatshirt having eaten no breakfast, face unwashed, typing these words to you. I don’t need to be more like a superhero, I just need to be quiet, and still, and listen to the voice inside, to love her, to give her some space, to do my best. I still love Jenny Goodguts, who was never a superhero, who never expected me to be either, who just wanted me to be myself. I’m not sending her away, but I’m taking off the mask and the cape that I thought she needed to wear, handing them back to Control-o, the dark vixen of constriction who keeps us small by making us feel like not good enough. Together, Jenny and I, who is just me and my soul, can notice, maybe even laugh, when Control-o is up to her usual tricks. Four years ago, on the day I blogged about my pants and began the journey that would lead to this book, I had a skill—I could organize words into a logical, frequently pleasing or amusing, arrangment. I could take the words and the thoughts around me and I could reflect them back. I could translate the things I heard people saying into a comfortable language for my handful of readers. But something was knocking. I knew I was missing something. Oh, I thought, maybe I need to organize x or y, maybe I need to change p or q, maybe if I can fix myself somehow, if I can fix something about the world, crumbling around me, then the knocking will stop, I will find some peace. When I started writing what would become this book, I had vocabulary, and structure, rhythm and a backpack of life experience. But I had not learned how to listen. How to pay attention. How to be open, to be brave enough, to say something new, something that I hadn’t heard before. Learning to look and to listen will change you. Except you don’t need to be changed. It will open you to what is true and real and beautiful. It will connect you to the light inside yourself and the light inside of others. Four years, and all of these words later, I will say: It is worth the time. My sister was a shadow. Her skin no longer felt the brush of wind. She had become the breeze. I never met her. But my first stories held her transgression. Conveyed her punishment. Her suffering. Zeus, King of the Gods, sought my cousins. He loved their strong, laughing bodies. Their husky, smooth songs. Their sharp, glittering eyes. He followed them, hungry, into the mountains, into the rivers, blue-green, teeming with life. His sister-wife, Hera, came looking for him – Hera, older than Zeus, tricked into being Queen of the Gods. Trapped into a life she had not asked for, Hera asked my sister for an answer my sister had been forbidden to give. Where is Zeus? she asked. I was told that Hera was jealous, vengeful and my sister verbose. Both of these – crimes. My sister, with her long, rambling stories and beautiful voice, keeping secrets from the Queen of the Gods. Hera, in her rage with her brother-husband, the one who had hung her from the stars, stole my sister’s voice. Cursed my sister so that she could no longer share her own words but only repeat those of another. My sister who fell in love with a flower, her beautiful body withered, her bones become rock. I listened carefully to my mother, to my cousins. I was a quick study. I had my sister’s way with words, her lovely voice. And I knew these things were a danger to me. I knew to speak these words, to use this voice, could lead to losing everything: My very body, the feeling of waves washing over me, the taste of a ripe peach. I learned to give Hera what she demanded: A dutiful echo. But I was plagued by dreams. I woke up, sweating, in the night. Hera beside me, I cowered. I have done what you wish. I have said nothing but what I have heard from others. Please, spare me. Too afraid to look in her eyes, I looked away. From the Queen of the Gods I heard the sound of ancient tears. I turned and saw deep grooves, canyons, where sorrow had carved a centuries-long path. With a weary tenderness she spoke. I am blamed, but he had already robbed her when he forbade her to speak the truth. I only made obvious what was already so. I don’t want to become a shadow. An echo is already a shadow. But I can feel the wind. I can taste a peach. I’m afraid, I said. I don’t want to lose everything. They said I would lose everything. And Artemis the hunter and Athena the wise warrior were there. Aphrodite. We are with you. I slept fitfully. Sunlight. I am breathing, alone in my room. I whisper the truth. I am awake. It is morning. Nothing happens. Birdsong. I pull back the covers, my feet touch the ground. I look in the mirror, speaking slowly. I am strong. Dust dances in a beam of light. Nothing happens. I walk outside, the symphony of limbs, light and dark, warm, cool. She was forbidden to speak the truth. I speak this to the trees, to the sky. I say it clearly. Repeat it. Nothing happens. The branches do not seem to mind. My legs start to move, before I know where I am going. I am walking, running. My lungs are filling with air, reaching for more air, not enough air. I am afraid I will run out of air before I get where I am going. But there is Theia, the shining light, mother of the sun, the moon, the dawn — my lungs are renewed. And the Muses, dancing with Apollo — more breath. And then I see Alice Walker up ahead with a bag of air. And E.B. White? There is so much air, I am full, to the brim, of all the air I need and I’m running, flying until I reach the cave. I stand outside, looking into its depths. I gather my strength and with all of the breath left to me I call, sending my words as far into the recesses as they will go: He is here. I hear my sister’s voice calling back: He is here – here – ere. I feel the sun on my arms, a swirl of wind. Birdsong. And my sister, blinking, steps out of the cave. My sister became a shadow. But I am not. I have hands and a tongue and a still-beating heart. I am afraid. I am alive.